At Urbanrest, we make beer and kombucha, plain and simple. The taproom was designed to bring the customer in to the beer making process with an open and inviting floor plan. 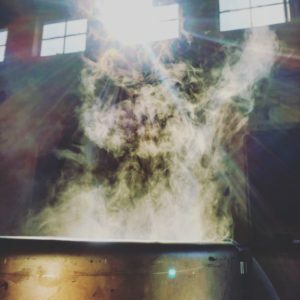 You can’t help but feel (and even see) the magic happening inside the fermenters around you. Our small 7bbl system was designed with reclaimed dairy tanks at the heart of the operation. We found these at local farms and are excited to bring them new life as fermenters, hot/cold liquor tanks and more. The rest of our equipment was either rebuilt or reclaimed by us or sourced from local artisans and craftspeople. In staying true to our roots, we’re currently fermenting in the traditional farmhouse style of open fermentation in order to provide the yeast an ideal environment for flavor production and ester formation. The diversity of flavors within the range of beer is nearly unfathomable. We love to experiment making many different beer styles. From traditional Saison to Stout, Barrel-Aged Quad to Gose, the diversity of beer styles is immense and we intend to tackle them all! Our beer comes to you directly from the serving tanks and kegs in which it conditions, so it’s always rotating and it’s always fresh. Kombucha is an ancient tea fermented with a culture of bacteria and yeast called a SCOBY. It is slightly sweet, effervescent and tart. It’s also high in B Vitamins, antioxidants and probiotics. We experiment with many blends of Tea from Ceylon Black to Yoonan Gold combined with a variety of locally foraged fruit, herbs and spices. We’re constantly looking to evolve and grow so stay tuned for more delicious beer, kombucha and fermentation experiments from Urbanrest.